Here's everything you need to know about indoor gardening gifts, whether you're an Indoor Gardener buying gifts for a non-gardener or you're buying gifts for an Indoor Gardener -- or for yourself. First, be sure that the recipient likes growing plants. Giving houseplants as gifts is almost as tricky as presenting someone with a pet they haven't begged for. Plants require willingness and commitment in the form of time, care, and attention. Scroll down the page to see our carefully chosen indoor garden gifts as well as some things to consider when buying plants for others. There are also ideas for those who have enough greenery but could use some interesting items to help their green thumbs accomplish their work. Or just help the indoor garden look better! Just a bit over one foot in diameter, the Stack-A-Pot makes good use of small spaces. You can grow a varied herb garden in this one multi-pot. Remember to turn it now and then so all your plants get the sunshine they need. An indoor garden that doubles as a decorative conversation piece, the Dome Terrarium grows herbs that last for months. With 5 herbs, an instruction booklet, and everything you need to get going, this makes a great gift any time of year, for any occasion! You're going to need to clip your herbs for use as well as to keep them growing thick and healthy. These Herb Snippers do the job beautifully! 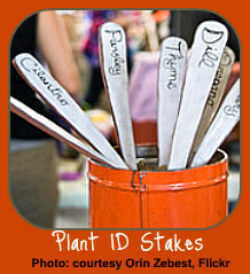 Click the link or image to read more about them and order a pair for your indoor herb garden. 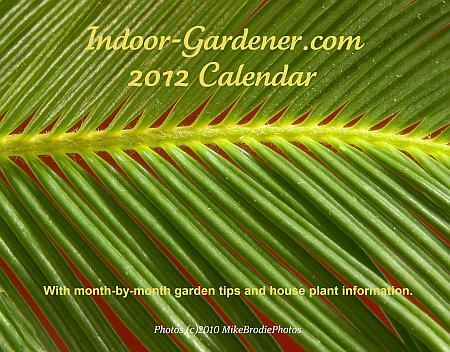 For those who like house plants and for those like only the idea of house plants, this 2012 Calendar from Indoor-Gardener.com highlights 12 different plants as well as monthly to-do lists. And the daily boxes on the pages are large enough to keep notes about the health and well-being of any indoor garden! Consider the following before buying a plant for someone you know. Do they have other plants already? Plants need space, time, care, and attention. People often pass on houseplants because they don't have the desire or ability to give them the care they require. If you insist on presenting them with a live plant, it will most likely end up droopy, dead, or - in the best circumstances - regifted to an Indoor Gardener. Some people just don't have green thumbs, no matter how hard they try. They may not have houseplants because they may be tired of watching them die under their care. Don't force more grief on them with indoor gardening gifts that need care they can't give. What kinds of plants do they already have? Someone with a collection of cacti and succulents, for instance, probably won't remember to spray and water a fern. Buying them another succulent, however, will result in heartfelt gratitude. Take their interests into account before making your purchase. Do they have space for another plant? Consider how they use their space, also. If they have a huge recliner on the patio in the windowed corner with a bookcase and lamp set up for comfortable reading, they're not going to appreciate a huge shrub that requires direct sun. A small ivy, however, that can perch happily on the edge of a bookshelf, would probably make them happy. Think about the needs of the plant as well as the activities and lifestyles of your friends and relatives. An airline pilot can't take care of a thirsty fern, but might enjoy returning home to a bowl of assorted cacti. And never buy a bonsai, no matter how intriguing or beautiful it is, for someone who hates details and has only a small attention span available. What is their home environment like? Especially in urban areas, apartments can be not only small but also dark. Most plants need light - lots of light. Even a "low-light" houseplant wants to see some sunshine during the day. Check the tags on the plants before you buy them. A few, such as a snake plant, survive shadowy apartments and windowless offices. Of course, if your best friend is an avid collector of orchids, for instance, and your third cousin twice removed on your second aunt-in-law's side is an orchid breeder in the Andes, home on a visit with legal specimens - by all means, wrap a ribbon around it and yell Happy Birthday! You'll be a hero. But if that's not the case, here are three ideas for indoor gardening gifts any Indoor Gardener will appreciate! Cuttings from your own indoor garden. If your friend or relative has admired one of your plants, take a cutting and plant it well before you need to give it. Use a pretty container and put a ribbon around it. Shopping spree. Why not take your friend or relative to your favorite (better yet, their favorite) nursery or plant store, state a price range, and let them pick the next houseplant they want? It not only results in something they'll be sure to cherish, but will give the two of you some quality time together. Gift cards. If you live at a distance or are allergic to plants, there's always the gift certificate from a local nursery or home supply store. Again, if they make the choice, they'll be happy with the result.